Our visit to the children to hand out your donations. 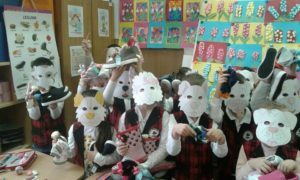 A UK dog rescue charity, at Easter and Christmas, we always extend our arms to the children of Romania. They are the future generation and those who will be loving the dogs in years to come. Our appeals are always shared amongst those children in desperate need of help, those who have so little. At the end of March our lorry left Big Yellow Storage in Sutton with the pallets that we had wrapped, full of your Easter shoeboxes. 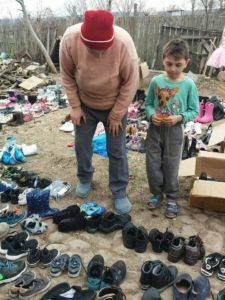 Literally hundreds of pairs of shoes, socks and Easter eggs, with many other gifts too, all heading off to Romania to help the children in desperate need. 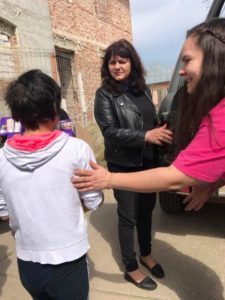 Just days later, our team from the UK flew out to Romania to join our team and rescuers over there and to start a week of visiting children. We made many separate visits: we were allowed access into the government run orphanages and children’s homes. We went into children’s homes where the entrance was not unlike a prison, security, gates, and of course – no phones or cameras. When we stepped inside, we knew why: for obvious reasons we cannot go into detail of what we saw and heard, but the harrowing screaming and locking-in of children, hiding them away from the world and society behind bars was truly sad. 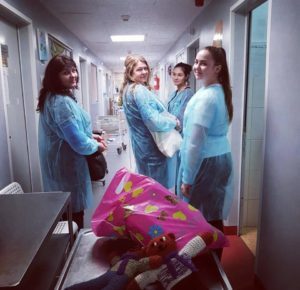 Our visit to the HIV centre was sad, hearing how the children have all ended up there, and most who will spend their lives there – outside of the world, away from society and never know a real life. A world behind bars. Our visits included private apartments, a government scheme, where the children live with their carer. Sometimes the children are not orphans, but gifted to the State by their parents. We heard that for some children, when they reach their teens and are strong, the parents then return to take the children for manual labour. Others are able to carry on living their and join society. 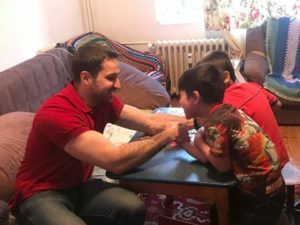 We spent happy hours at one boys’ home in Bucharest. They were happy to play jigsaws and games with us, to enjoy an Easter egg hunt in the apartment. 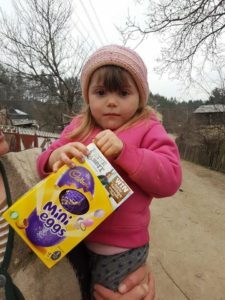 We took Easter eggs, and lots of food with us for them to enjoy. One of the government councillors came along with us on our visit here, and the boys loved arm wrestling. 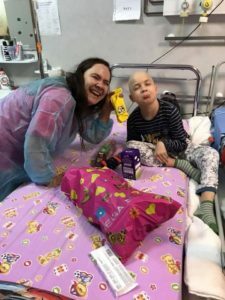 One of our saddest visits was to the children’s cancer unit in Bucharest children’s hospital, and to meet those children too sick to go home for Easter, some of whom whose cancer was terminal. We took along donations of blankets, socks and Easter eggs. We bought non-perishable food from the local shop, and a toy for every child too. Knitted teddies, extra gifts, and most importantly, our smiles. 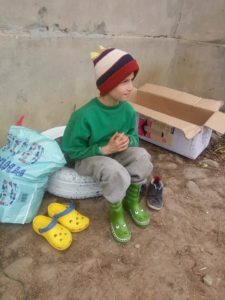 It was very difficult with our emotions in turmoil, as we met each child, most with a parent there, and heard about one orphan coming in for treatment – with no one in the world to be with him. 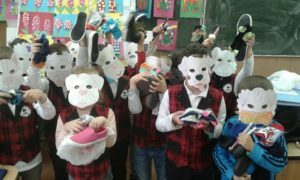 Hundreds and hundreds of children in South Romania were overjoyed at your kindness and were so excited to receive your socks and shoes. We took masks which were coloured in by each child, and this also meant that we were able to take a few photos as a momento of an amazing day, and also to share with those of you who so lovingly joined our campaign this year. 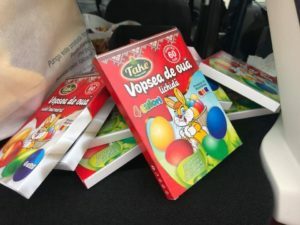 With Orthodox Easter in Romania being one week later than the UK Easter, our team had one more long visit to make with your donations, and a very meaningful visit for us too. 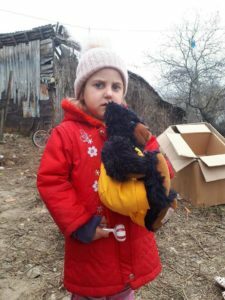 At Christmas during our Santa trip with your shoeboxes, we went to a village in Moldova. 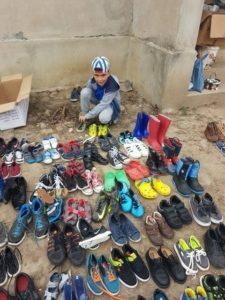 Seeing the children in summer sandals, many with no socks, was our whole motivation for extending our Easter appeal this year beyond the usual Easter eggs. Other donations our team were not able to distribute ourselves, but our Romanian team and rescuers continued. Some establishments we were not able to access ourselves, and the priests did this for us. 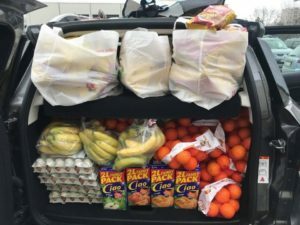 Every single item donated was given out, no matter what the donation was, how small or how big. Every donation was so gratefully received. 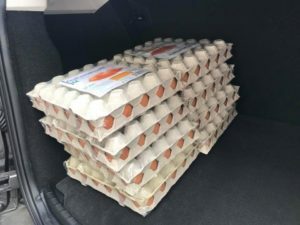 For those who were not able to donate, but gave us money donations, we bought literally hundreds of £ of food in the local supermarkets. Receipts available to anyone who wishes to see these. It was a week of hugely mixed emotions, yet every single child we met had a smile for us. We were honoured to be the ones distributing your donations, and thank you for your massive support of our Paws2Rescue 2018 Easter Shoebox Appeal.